After understanding the need for change in conventional thinking about supply chain management by metrics and how to anchor the flow-based methodology in an organization, one last step is missing: The process of implementation, which will be covered in this article revealing CAMELOT best practice. Flow Metrics are derived from the strategy, enable flow and should give a comprehensive view of supply chain performance. For the implementation, aspects concerning the organization, culture, the techniques as well as the processes must be considered. Figure 1 shows the so-called building blocks that are touched within an organization when implementing Flow Metrics. 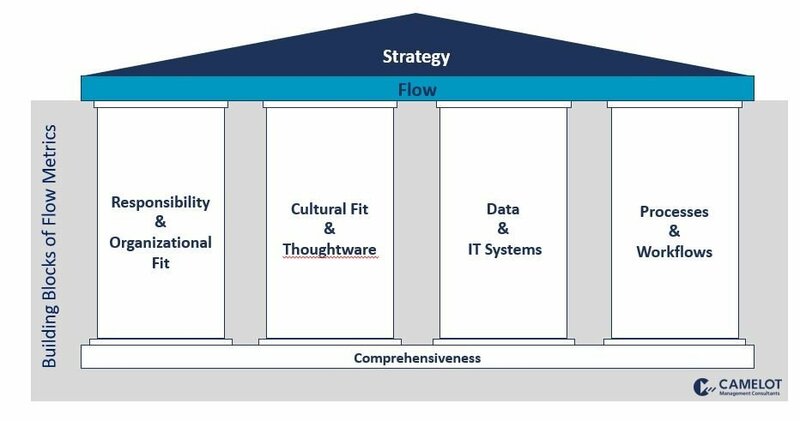 The configuration of these building blocks, that cover several business dimensions, is a necessary precondition to use metrics successfully for flow and strategy enablement. First of all, contradicting measures must be avoided by selecting and defining tactical measures which support the delivery of the overall strategic objectives. Flow Metrics are aligned to support delivering the overall strategy in a top down approach. Visibility on how tactical measures assist achieving strategic objectives creates organizational alignment and provides common objectives to all employees. Understanding relevant ranges: Most companies fail to recognize that the information to be used in the strategic, tactical and operational planning range is vastly different, e.g. usage of full cost (incl. fixed cost) is not relevant in short-term decisions. Flow-based operating model: Flow must be the common basis for day-to-day decision making. Does the decision increase the speed of flow? Does the decision reduce the variability of flow? Does the decision increase the relevance of flow? Understanding Flow Metrics: The metrics are derived from the strategy, they cover speed, variability, relevance of material, information and cash flow and are linking the relevant planning ranges. Tactical reconciliation between relevant planning ranges: The strategy is the guideline for operational capabilities. Model performance is projected under (assumed) conditions and feedback is provided to strategy by operational capability and performance. Flow Metrics need to be integrated into the organizational structure and systems with clear responsibilities and accountabilities. They are defined and shared with all stakeholders to ensure common understanding, and all stakeholders work with the same numbers. Metrics are used consistently throughout departments, and incentive systems are designed to drive improvements in measures by assessing individual performance based on improvements in these measures. For each metric a responsible and accountable person is defined who has sufficient authority to decide in order to drive improvements. The organizational structure has to be mapped to represent the KPI hierarchy and responsible persons must have direct ability to influence drivers of measures. Flow Metrics need to be implemented in the organization’s common thoughtware and fit to its culture to efficiently promote and protect flow. The speed of material, information, and cash flow can only be promoted and protected sufficiently if the idea of Flow Metrics is totally anchored in the people’s minds as well as fully integrated in the organization’s culture. All people within the organization need to be able to think and communicate systematically which means integrating and understanding information from different sources and types. There is a common problem-solving language and framework to follow the same objectives using the same measures and data. People understand the connections between departments, resources, and people and what drives the speed of flow. They are able to convert data into relevant information and to identify where variability accumulates and amplifies to effect total system flow. Availability: Data is readily available through various online channels (e. g. mobile devices). Consistency: All available data sources agree on a “single version of the truth” that remains stable. In the rare cases when mistakes have to be corrected, updates are pushed to users, explaining the need for the changes. Interfaces and data transfer tools facilitate identifying new links while ensuring consistency of data and calculation methods. Actuality, timeliness and speed: Speed of the flow of relevant information is maintained according to agreed timelines, and the system is fast even for “big data”. Integrity: Technical means ensure data integrity and quality, also across different sources. Transparency: People share a common understanding about measured data. Integrated documentation of data and tools ensures that the same calculation methods and master data are used for all performance measures to enable comparability among all people and departments of the organization. 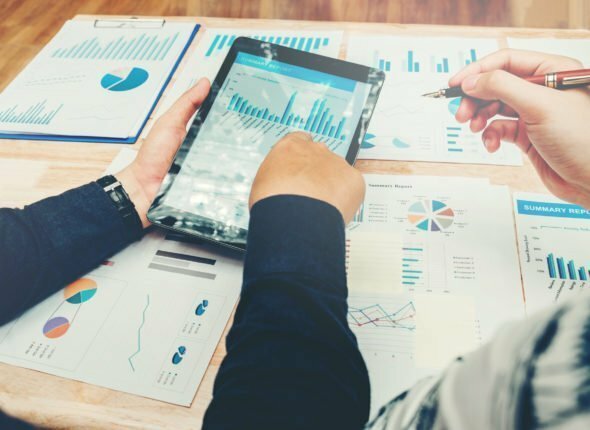 Relevance: Data captured must be relevant for the metrics looked at and information is aggregated and displayed in dashboards and reports in a way to focus on the right measures and to accelerate reactions and decision making. Analytical tools offer user-definable drill downs to provide analytical insights. Security and protection: Data is protected against outside access. Everything is available from within an organization, as long as applicable law and rules do not forbid it. State-of-the-art forecasting and simulation tools: User-friendly tools are available to predict the effects of changes and events on defined performance indicators. The ability of corporations to manage their business according to defined strategies and to continuously improve is based on a well-defined measured and actively used KPI framework. A cross-company supply chain strategy is the basis for target definitions and selection of Flow Metrics. After defining the Flow Metrics, target values are set based on calculations, benchmarks or other values. The target achievement results must be measured and documented continuously. Deviations from the goal are analyzed and countermeasures are deducted to close existing plan-forecast-gaps. Learning from the process loop, implemented Flow Metrics are reviewed thoroughly. Optimal value ranges are identified, and outliers are eliminated. If necessary, adjustments of metrics, target values and/or processes are performed to improve the process in the following time periods. As Flow Metrics are directly derived from the strategy, they need to cover all types and aspects of flow including financial, operational and other relevant topics as sustainability or customer relations. Now that we know the required changes to implement Flow Metrics that lead to overall performance improvement, I will focus on how to define and introduce a Flow Metrics Framework from strategy to implementation in my next blog post.